Okay…we are going to stray (slightly) from our regular CANNING programming to bring you Man VS Common Sense ~ a Sunday afternoon eat-a-thon. Yes, that’s right you heard it here first, Matt and the boys from work (Ben and Ian) decide to create their very own eating competition. 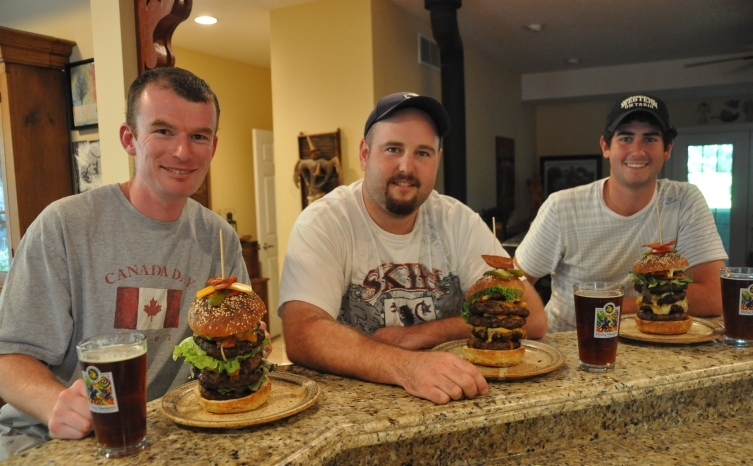 The first in what appears to be a series is hosted at our home…The 2 Pound Burger Challenge. Each competitor must consume two pounds of ground beef. Mmmm…delicious burgers. The meat purchased from Stephen’s Butcher Shop is the best in all of Muskoka. Richard freshly ground 8 pounds of beef knowing full well Matt’s intention was to make some gigantic beef burger flame grilled and seasoned to taste. Only the best for these competitors. There is no time limit. 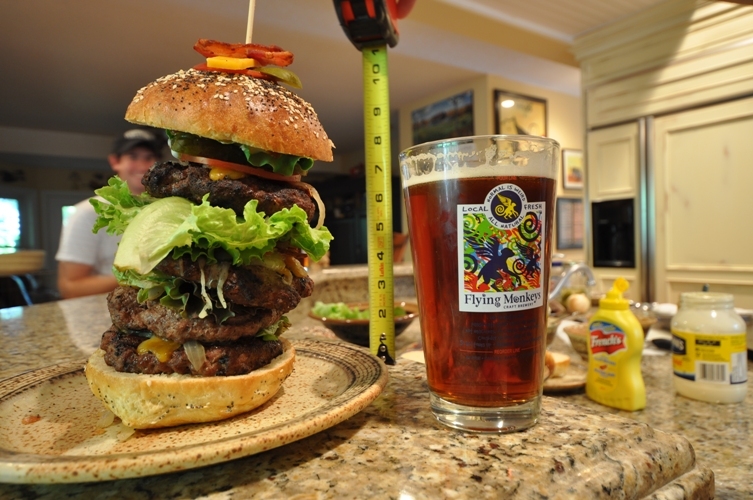 However, the first person to finish a two-pound burger (including home-made bun and toppings added) plus 3 pints of Flying Monkeys Hoptical Illusion draft beer wins the title and spoils of the competition. The spoils…more beer! Matt carefully weighed each patty. 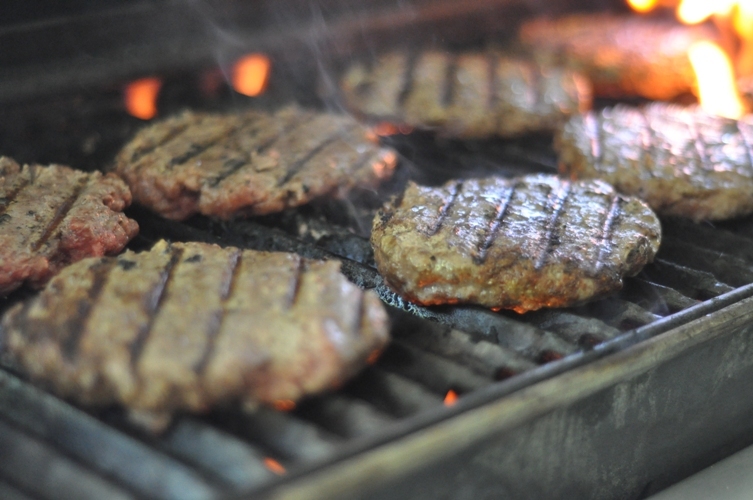 The three competition grade burgers consisted of 4 ~ 1/2 pound patties of ground beef, seasoned to taste, and flame grilled. Each competitor is allowed to dress the burger with his preference of toppings (including our homemade pickles, tomato jam, bacon, fried onions, mustard, mayo, etc) but whatever goes on the burger must be consumed. 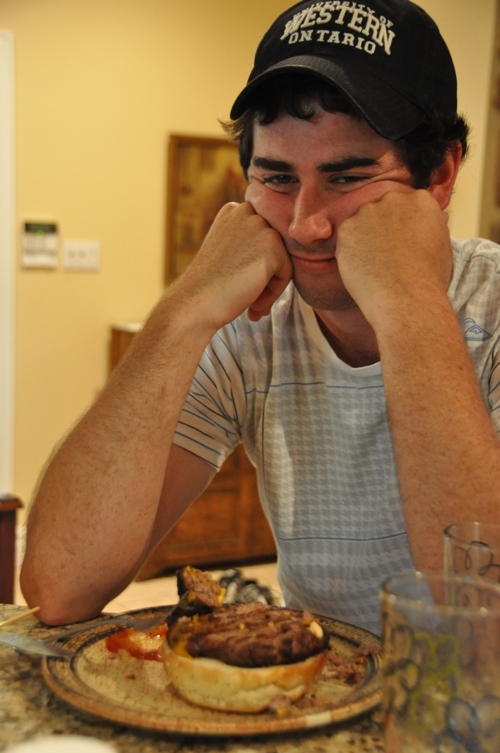 The burgers are dressed, the height is measured, and recorded, and everyone takes one last look at their plate. And, the winner is…with 28 minutes on the clock…drum roll please…Ben Carter! 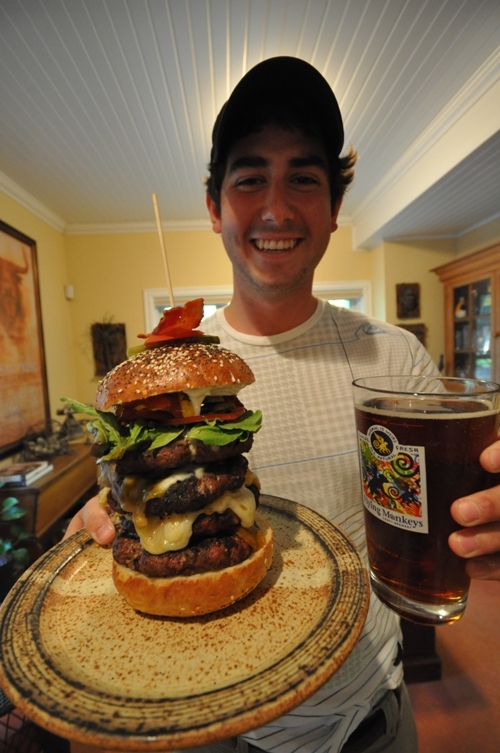 Ben Carter wins the 2 pound burger challenge and even manages to drink three pints. We think he surprised himself!?! 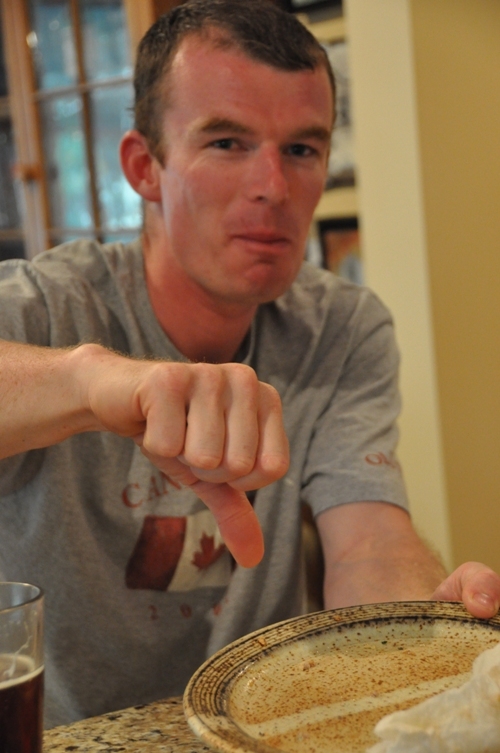 Matt Turnbull was able to swallow all of the food and 4 pints...but he still choked. 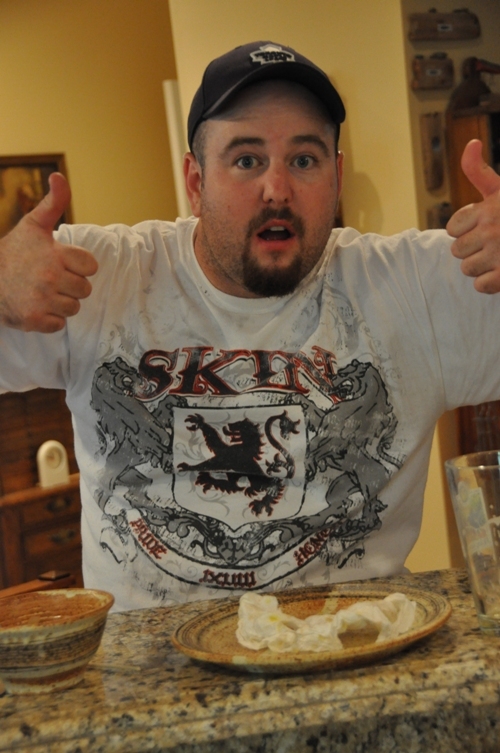 Better luck with the chicken wing challenge! While Ian McKee didn't have the appetite of his fellow competitors, he still managed to loosen his wizard sleeves. Bottoms up? We will resume our regular canning posts over the course of the next few days with currant jelly, currant leather and a really easy recipe for flavoured vinegar to come. Awesome! Those guys are monster to eat those huge burgers.. I can barely eat half of that, that’s really too much and for drinking 3 pints WOW, what a stomach.